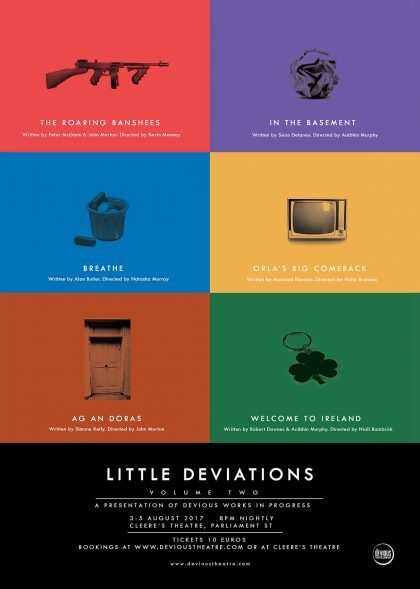 Little Deviations is the name we’ve given to our rough and ready showcase of new works in development. Volume 1 took place in August 2013. Volume 2 took place from 3rd to 5th August in Cleere’s Theatre, Kilkenny as part of Alternative Kilkenny Arts. It featured work in progress showings of six new plays. Orla’s life has been governed by Ireland AM for too long. 2,730 hours too long in fact but who’s counting? Orla, an ambitious journalism graduate, feels trapped by the hours that she has spent watching Ireland AM with her twin sister Dee, an Ireland AM super fan with severe health problems. However, the show Orla once resented so intently becomes a source of inspiration and solace to her when she is forced to stake out her own independence. Hugh really wants to be poet. However, he is inescapably and tediously bad at it. In frustration with his own shortcomings Hugh decides to look at all his favourite writers and see what they have in common; what is the special formula for brilliance? What he finds is tragedy, death, sexual escapades, and general debauchery… all of which he is going to try in the name of finding the Muses. Emily never thought she’d end up here, being interviewed by the hospital’s psychiatrist. But this is where she is and its what she needs to do. The stories she will tell and hear will shape her. From where she came from to where she’s going. Five women, five stories. What do you do, when you can’t keep going? Welcome to Ireland. Welcome to the land of tradition. Welcome to the land of high rent, high tuition and getting high. Welcome to the land of art and culture. Welcome to the land of the green drugs, the white people and… oh wait, there is no gold. Welcome to the lives of the millennials. Welcome to the flat of Bryan, Maggie and Damien. Welcome to their world as struggling artists. Welcome to their stuffy staff-room, which is also their littered living room, in their shoddy Tourist Gift Shop. Welcome to their lives working for Bill, their bitter boss who loathes the arts and the people in them. Úna is on her annual visit to her family, the O’Sullivan’s in Kilkenny. Every time Úna visits, a familiar sight signals her arrival. A tall, elderly lady nicknamed Ag an Doras stands in a doorway, slowly smoking a cigarette, watching silently as the world goes by. On this occasion, however, her door is closed. Úna makes it her mission to uncover the story behind Ag an Doras and why the mysterious figure is no longer at the door.